Before the emergence of internet and other data networks telecommunication only had one simple meaning, the telephone. Today, telecommunication industry has become much more than that, we are so used to it now that the world would collapse if it was taken away. The inventions and innovations that have accompanied the technology revolution have impacted every sphere of our lives and ICT industry has become the most important sector for every country. ICT has taken the central stage, ready to make Pakistan a digital country. There are number of factors that have contributed to the tremendous growth including Pakistan growing population especially in urban areas which means there are a lot of potential consumers coming online every day. Pakistan’s economy also grew by 5.7 percent in fiscal year 2018 and if the similar trend persists, Pakistan could become the fourth fastest growing economy by 2030. The country’s growing smartphone market is another attraction, currently there are around 152 million cellular subscribers, and 60 million 3G/4G mobile broadband (MBB) subscribers. The number is expected to grow further due to falling smartphone prices and cheap data rates. The Chinese-Pakistan Economic Corridor (CPEC) is the largest Chinese investment venture in Pakistan with around $62 billion, this alone is considered the monumental aspect in the overall economic progress that will have a definite impact on the ICT Industry. Pakistan also saw a new Party emerge from the elections of 2018 that has a youngish leadership and outlook, with technology and innovation as part of its core agenda for growth. 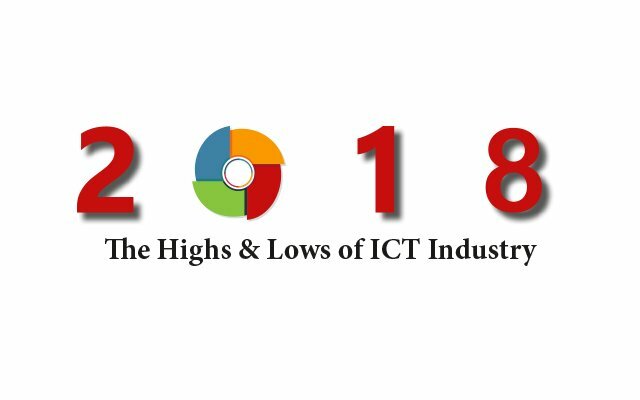 With such favorable conditions and encouraging outcomes, our ICT industry witnessed number of landmarks in 2018. In the industry round-up we present to you milestones our industry has achieved in the last 12 months and the issues and challenges that still need to be managed. Telecom sector is one of the fastest growing sectors of Pakistan that has created number of opportunities for the country. Although the stats for year 2018 are not released yet but based on the growth trend of last few years, we can expect a steady increase in revenues of around 1 million this year as well. The year was especially good for the mobile operators as considerable growth was witness in their revenues as well. Despite the tough competition in cellular market, Ufone saw 21% improvement in its Q3 2018 revenue due to its increased 3G footprint by upgrading network sites. Solid organic growth was also witnessed in Veon’s overall revenues as well. Pakistani was the biggest market for Veon in Q3 2018 with almost PKR 49 million, an impressive YoY growth of 18.7%. Telenor also delivered a good quarter with revenue growth and strong profitability. It posted its highest ever revenue of Rs. 30 billion during the third quarter of 2018, up by 11.5% from Rs. 26.89 billion during the same period last year. Zong is the only company that has yet to post its first profit in the Pakistani market. The company, in its responses to Profit, clearly states that being the official Chinese cellular company in Pakistan, their strategy is to enable connectivity for the government, businesses and people of Pakistan and provide them with wider and faster 4G network thus not worried about profits even 10 years after commencing operations. According to telecom experts, if the industry is earning $2 [ARPU] from voice, Zong is earning $10 from data which means that their strategy is good and it has even worked. The cellular market in Pakistan is growing at a very healthy pace. The uptake of 3G/4G has been quite impressive that has given the government and the mobile operators the confidence to look forward to 5G. The number of mobile subscribers reached 152 million in November 2018 up from 143 million in November 2017; showing an impressive growth of 8 million subscribers in a year. Similarly, the 3G/4G subscriber base reached 60 million in November 2018, up from 47 million in the same period last year. Mobile operator Jazz leads the Pakistani mobile market with over 20.6 million mobile customers, followed by Zong (17.9 million), Telenor (13.7 million), and Ufone (8.2 million) by the end of November 2018. With new and innovative technologies coming to the market every now and then, the competition among smartphone brands is also getting fiercer. Many brands entered the mobile market in 2018; some were a hit while others totally miss. The market share of big smartphone brands also changed position in terms of market share. Samsung made a great come back in Pakistani market with its low and medium price devices, especially in 4G enabled device category. Whereas, QMobile that previously was the market leader witnessed a huge dip in its market share after it was engulfed itself in tax evasion controversy. According to the market research, the most successful smartphone brand in Pakistan was Huawei that managed to capture a huge chunk of Pakistani market. The market share of Huawei in Pakistan reached 22.2 percent in second quarter of 2018 against 10.5 percent of the corresponding period of 2017, showing a jump of 111.4 percent annually. Mobile phone market segment witnessed commendable growth this year. More and more people are now moving toward smartphones which are naturally more expensive, hence increasing the cost of imports. In the first four months of fiscal year 2018-19, the mobile imports increased 6.2 percent as compared to last year which means that import of mobile phones remained at $260.41 million against the import worth of $245.21 million during the same period of July-October 2017-18. While on year-on-year basis an increase of 2.9 percent was witnessed taking mobile imports to $119.99 million in October 2018 from $116.6 million in the same month of preceding year. One of the most monumental and groundbreaking initiatives started this year was the launch of Device Identification, Registration and Blocking System (DIRBS). This is considered one of the few pioneering systems being deployed by any regulator. The system is designed to detect and block stolen and non-type approved mobile phones working on mobile networks. The system shall result in the elimination of smuggled mobiles and other illegal SIM-based devices. The system will not only discourage mobile theft and illegal imports but will also improve the quality of mobile service as well. The innovative solution will enhance government revenue and benefit the entire mobile ecosystem, by ensuring that devices are only imported through legal channels. With the new government coming in to power, a new Minister of MoITT was also instated this year. Dr. Khalid Maqbool Siddiqui, a doctor by profession has been in office since 20 August 2018. Just recently, Gen (R) Amir Azeem Bajwa was appointed as PTA Chairman while Dr. Khawar Saddique Khokhar was made the Member Compliance. Under the leadership of Previous Chairman Dr. Ismail Shah and Minister MoITT some ground breaking decisions were made that pushed the industry forward but we have yet to see how the new chairman and administration will perform. Another important decision taken by PTA this year was the reduction in Mobile Termination Rates. MTR is a price which cellular operator charges another operator for receiving a call for all other types of calls- local, long distance and international incoming calls. Previously it was Rs 0.90 per minute which is now reduced to Rs 0.80 per minute. The existing MTR rate in Pakistan is 111-198 percent higher than other comparable countries. Mobile operators have been trying for many years now to convince PTA to reduce MTR. Now that government has finally agreed to it, it will surely bring down the off-net call charges for consumers. Availability of radio frequency spectrum for technological developments in telecom industry is of crucial importance. With ever increasing number of mobile users and emerging technologies especially for wireless broadband services, the effective spectrum management has become even more important. This has forced regulators to introduce measures to liberalize the markets by introducing lenient policies to meet the growing demands of radio frequency spectrum. PTA has also decided this year to allow Pakistani mobile operators to spectrum sharing and trade under certain condition. PTA released its spectrum sharing framework back in 2017 but consultation on framework by stakeholders was invited in April, 2018. To ensure better quality of service for the consumers PTA also changed its tower sharing and acquisition regulations. While the State Bank of Pakistan also approved local lending for telecom business. These positive outcomes from the Government are reflective of Pakistan’s push to increase foreign direct investment into the country while fulfilling its digital agenda. The rapid growth in mobile data traffic and consumer demand for enhanced mobile broadband experience have led to an increasing emphasis on the upcoming fifth generation of mobile technology. In this regard PTA has developed a draft framework to enable the use of radio spectrum on trial basis for non-commercial purposes to carry out trials for innovative use of radio frequency spectrum, apparatus/equipment and academic purposes. In order to nurture entrepreneurship, job creation and innovation in ICTs, the government has facilitated over 121 startups through National Incubation Centres (NICs) in Islamabad, Lahore, Karachi and Peshawar. This alone has created more than 800 jobs and generated revenues of around Rs. 319 million as revenue. To further improve the ICT environment and attract international companies to do business in Pakistan, Prime Minister has given approval to the formation of a 14-member task force on IT and telecom sector comprising well-known members of Pakistan’s tech sector. The committee will work on skills development and producing quality human resource and will also present ideas on how to increase Information Technology and telecom exports, build Software Technology Park, strengthening academia‐industry‐government linkages and an Innovation Fund Programme to kick-start development of low-cost, high impact applications and systems in the public sector. The deduction of taxes imposed on the top-up of prepaid cards by cellphone service providers and the Federal Board of Revenue (FBR) was also suspended this year on orders of the Supreme Court of Pakistan. Previously, for every cellular charge, 5.5 percent was deducted as a withholding tax, 19pc as sales tax and another 10pc as service charges were deducted. Roughly, Rs38.08 was deducted on a prepaid mobile card of Rs100 which is a huge amount, and people showed great displeasure every time an increase in mobile top-up tax was imposed. Pakistan has also made some great achievements on the international front as well. A remarkable feat achieved was winning the elections for International Telecom Union (ITU) Council seat in Plenipotentiary Conference held in November 2018 in Dubai (UAE) by securing 155 votes out of 177 member states. An international awards program, APICTA Awards take place every year to create ICT awareness to bridge the digital divide in Asia Pacific region in which number of countries apply in hundreds of categories. Pakistani technology companies and startups have once again proven their metal at the 18th Asia Pacific ICT Alliance (APICTA) Awards that took place in Guangzhou, China. Competing with the top companies from 17 countries across 23 Top Awards Categories, Pakistan bagged one gold award and six silver awards, declaring the delegation third in terms of yield. Dr. Umer Saif is a well-known name in IT fraternity; he is the one who put all his efforts in successfully digitalizing Punjab. Due to his tremendous hard work, he was named UNESCO chair for information and communication technology for development. Umer is the only Pakistani who is named among the top 35 innovators in world by MIT technology review in 2011, and a young global leader by the world economic forum in 2010. He is the only Pakistani who is honored with the Google faculty research award, Mark weiser award, MIT technovator award and Microsoft research digital inclusion award. He was also granted with British Outstanding Alumni Award 2017. In 2014, he was presented with sitara-e-imtiaz by the government of Pakistan, and he is named as the most influential Muslims in the world in 2014-18. Athan was the only made in Pakistan app that made global waves after being featured as one of the fastest growing application in the Asia Pacific region at the Google App Summit 2018 that was held in Singapore this year. The application provides accurate prayer times in every region around the globe as per their location and jurisdiction, helped them find the direction of the Qibla from anywhere, and provided heaps of vital information on Islamic principles. Another important achievement of government is the provision of telecom service coverage to the un-served and underserved areas of Awaran, Khuzdar, Kohistan, Kharan, Chitral, North Waziristan and Khyber Pakhtunkhwa (KPK) etc. Furthermore, 1037 km of Optical Fibre Cable (OFC) in 20 Tehsil Headquarters (THQs) and major towns of Baluchistan and Punjab has been laid. Mobile network operators also increased their network coverage with more than 41,000 cellular network sites providing service coverage to 88% of the population. This inceased coverage resulted in tremendous increase in data usage that reached 1,258,843 tbs of mobile data usage in 2017-18 up from 690,345 tbs in 2016-17. Government is the most important stakeholder in any industry since it is the one that gives direction to the businesses by outlining rules and policies. If a government is not interested in a sector or industry, the chances of growth in that area will be minimal. All businesses require government support and backing to create a strong foothold in the market. For telecom and IT, industry government’s support is especially crucial. There is a number of issues that are still unresolved despite being highly important. Internet security and data breaches have become a worldwide concern but some countries are better prepared for such situations; unfortunately Pakistani is not one of those countries. The major attack of the year started in mid-October with Bank Islami that spread across 22 banks in Pakistan and resulted in more the 20,000 cyber robberies. Earlier, Careem and Bank Al-Habib data was also stolen whereas; cyber-attacks on various websites have also become a common thing. Pakistan really needs to focus on the development of a comprehensive cyber security strategy to protect its people and government assets. With the increased smartphone and 3G/4G penetration, the fixed line market is declining every year. Few years back there were around 11 fixed-line operators in Pakistan but today there are only 3 left. In 2015-16 the number of fixed broadband users was 457565 that decreased to 327996 in 2016-17. Due to the dominance of mobile platform the fixed broadband penetration is expected to decline further over the next five years. But there is no denying the fact the fixed line broadband industry is highly important to complete Pakistan’s digital agenda. The fixed-line industry requires special attention from the government to sustain in the market. One of the constantly prevalent issues for Pakistani industry is the network shutdown. Unfortunately Pakistan is facing security threats for over a decade now and like everyone else telecom sector has also suffered greatly. On every important occasion like Muharram, 23rd March Parade day, protests and sit-ins telecom services are suspended around the country incurring huge cost to the mobile networks. In sensitive areas like different districts of FATA and Baluchistan telecom services are suspended even during the regular days due to security reasons. Secondly, with the advent of various social media platforms and increase in internet users, more and more people have turned towards social media to share their views and communicate with the masses. This has played a major role in creating awareness and educating the people about various issues. But fearing the power of the new technologies, many governments have devised ways to filter, monitor and obstruct the openness of the internet. In Pakistan internet clampdown has specially intensified over the last few years. According to an internet freedom report by global watchdog Freedom House, Pakistan ranked “not free” for the sixth consecutive year in 2017. According to digital experts, this strong wave of internet crackdown is the result of PECA; the country’s first comprehensive cybercrime act that was passed in 2016. According to PECA, PTA has the complete authority to block anything it considers to be ‘objectionable content’- a broadly-defined term under the law whereas, prior to this law there was an inter-ministerial committee which would direct PTA to block the content after doing its evaluation. PTA is also working to develop a national level firewall system that could block access to the objectionable content or websites available online. The project is called “Web Management Solution (WMS). However the ambiguous law and complete authority given to PTA has led in increased surveillance by the state authorities that can be deemed as violation of freedom right as the government authorities are blocking all the content that criticizes their policies. Therefore, simply blocking the content is not the solution, we have to set our boundaries first and decide what exactly can be termed objectionable and what constitutes violation of basic human rights. Although the uptake of smartphone is a good sign for the market but it puts huge burden on the national exchequer. For instance, during the current fiscal year alone, mobile imports cost reached $260.412 million. Since the need of smartphone is increasing in Pakistani market, a better option is to attract OEMs to build manufacturing units in Pakistan. This will not only tone down the pressure on import expenses but will create number of job opportunities for the locals as well. Unfortunately, no previous government has been successful in doing so. We need better regulations and environment to create ease of doing business in Pakistan so that manufacturing companies take interest in Pakistani market from production point of view. Supported by growing tech-savvy population, increasing businesses and rising internet penetration, Pakistan is destined to become one of the fastest growing economy by 2030 and poised to grab position among the leading digital economies. There is a lot of potential in the IT sector of Pakistan with young population turning to computers and other digital technologies creating a huge market for local and foreign investors. However, more work is needed to be done in order to fully utilize the existing potential. Prime Minister’s decision to form a task-force on IT and telecom sector is a very encouraging decision that will surely bring fruitful results in the future and hopefully 2019 will be a much better year for Pakistan.